There may come a point where you need to close your credit cards. It just does not make sense to have multiple credit cards open. Once you have paid off your credit cards, you should close the majority of your credit cards, but you must approach the situation carefully. 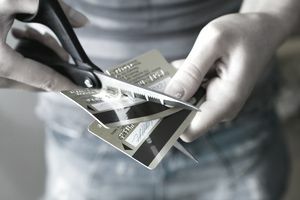 You can damage your credit score if you close the wrong cards. It is important to make sure you have a good emergency fund saved up so you no longer rely on the credit cards in emergency situations. First you will need to determine which credit cards you are going to close and which ones you want to remain open. You should keep your oldest credit card open, even if the rate is your highest interest rate. Part of your credit score is determined by the length of your credit history, and if you close your oldest credit card you will shorten the length of your credit history, which will lower your credit score. You should also keep open the credit card with the lowest interest rate. You want to have the majority of your credit limit available to improve your credit score as well. Once you have determined the two cards you will leave open, you need to begin to close your credit cards out. Do not do this until you have paid off the balances in full. You can close a credit card by writing a letter to the bank and requesting that they close your account. Send the letter with return receipt requested, through the post office, so that you know that the letter has reached the credit card company. Additionally, you should request the credit card company send you a letter stating that the account has been closed. Check your balance to make sure that it is paid off, and then call in about a month to make sure the account has been closed. If it has not, then you can request that the account be frozen. Check to see if they have received your request to close your account. You will need to resend the letter, because they require a signature and proof in writing to close the account. It is important to always follow up and make sure the account is closed. Never assume that it is, especially if your card had an annual fee, because missing the payment on that can ding your credit score. After a few months you should pull your credit report to make the account shows up as closed. If you know that the bank has closed the card, but it is still not closed on your credit report you need to contact your bank again and ask them to report the account as closed to the credit bureau. It can take a few months for this to show up on your credit report, but if it still has not been reported after six months you can ask to have the credit bureau check into the account for you. Do not close your credit cards until you have paid off the balance in full. Credit cards companies are more willing to work out a payment plan with customers that have open accounts, and will negotiate lower interest rates. Once you close an account with a balance on it, then you are stuck paying it back on the current terms of the agreement. The credit card company may be able to raise your interest rate as the market adjusts. If you are closing your credit cards as you pay off your balances, you can hurt your credit score, because a part of your credit score is determined by how much credit you have available, so you may want to have one credit card that is not carrying a balance open at all times. It is important to understand how your credit score works and how closing your account will affect the percentage of credit currently being utilized, when then affects your overall score. If you are working on building your credit to apply for a home loan, you should be careful about closing your accounts out. It is important to fix past credit mistakes and get your debt under control, but you want to make sure to have a long credit history too. Make sure you have addressed the other problems with your credit report, such as late payments or charge offs. Many people use their credit cards as an emergency fund or a way to earn extra cash or rewards. You can avoid using them during an emergency by building up an emergency fund and creating a budget that will prevent you from overspending. If you are using credit cards to for the rewards, be sure to pay the balances in full each month. You may want to stop using the card until you have paid it off in full so that you are no longer carrying interest on your purchases. This will allow you maximize the rewards. Remember the cards only offer the rewards because they make more on interest from the majority of customers and want to encourage you to spend more money. Are You Ready to Get a Credit Card? Read this first. How Using a Credit Card Can Actually Improve Your Credit Score. Are Credit Card Rewards Really Worth It? Are Store Credit Cards Worth Using?